How on God’s green earth do you ever get the God that made the whole world to hear you and to respond to you when you are in a desperate situation? There is a way. And when you learn that way, you will save your life and your children’s lives too. There was a fellow some years back who was desperate because his daughter was dying. He knew Jesus had the answer. And whether you know it or not, He has the answer for you, and you’re desperate for that answer. This fellow loved God, trusted in God and believed in God so much that He was willing to fall on his knees and bow down before Jesus in the middle of a crowd. He was desperate for God to find favor with him. If you’re like this fellow and are desperate for God to find favor with you, turn to Mark, chapter 5, verse 22. And, behold, there cometh one of the rulers of the synagogue, Jairus by name; and when he saw him, he fell at his feet. Now, let me teach you something here. Anything that you ever see a human being doing to Jesus when He was ministering on earth in person, you can do. You can get the same results by doing the same thing now by faith. God is a faith God. By grace you are saved through faith. (Eph. 2:8.) By the mercy of God through faith, you are healed. Because of your faith in God, He will perform miracles in your life. You could say, “But Norvel, Jesus was there in person.” It doesn’t matter. You can do the same thing by faith today. That is what the church is all about. You have a right to come to the altar and get it. You can’t sit there in your seat and be full of pride and expect to get something from God. You have to come God’s way. God likes you to come publicly. He likes to watch you walk down the aisle and bow down on your knees before Him at the altar. He likes to put his power on the inside of you. He likes to put his arms around you and love you like you’ve never been loved in all of your life. So get rid of your pride and come to God His way. Jairus did. Now notice, after Jairus fell at Jesus’ feet, he believed Jesus would help him. Look at what he says in verse 23. 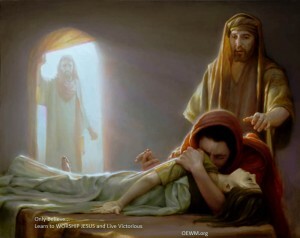 And besought him greatly, saying, My little daughter lieth at the point of death: I pray thee, come and lay thy hand on her, that she may be healed; and she shall live. If you were God what would you do? I would do the same thing Jesus did. If I was Jesus and was walking along like this and some man approached me and came and fell at my feet and said, “My little girl lies at home at the point of death. Please come and lay Your hands on her, and she will live and not die,” I think I would listen. I don’t know all about God, but I know quite a bit about Him, and I’m telling you that I have never known Him to turn anybody away who did that. Never! Not one time have I ever seen Jesus turn away anybody that worshipped and bowed down before Him in reverence asking Him for help. He didn’t turn me away. He didn’t turn my daughter Zona away. She had been on dope for three years, and I had been praying for three years, but she wouldn’t listen to me or any other human being. Then one day, God sent an angel, and she listened to the angel. I can tell you that! She hasn’t taken any dope since. true being that spoke the world into existence and has all knowledge. Believe me, your case is not too hard for Him. And Jesus said, “Well, I will,” and went with the man, and the daughter died while they were on their way. And Jesus said, “Don’t be afraid. Only believe.” And He kept on walking, full of faith, full of power, full of knowledge. Death didn’t scare Him. He kept on walking. … Why make ye this ado, and weep? the damsel is not dead, but sleepeth. So there was Jesus. When He arrived, people were crying. When He told them she was only sleeping, they began to laugh at Him. But He didn’t pay any attention to them, and He took that father and that mother into the room where their daughter was and took her by the hand and lifted her up then he told them to get her something to eat. Even death can’t hold back the power of God! Now why would God do something like that for a human being? Because he had found favor with Him. “Well, now, Brother Norvel, I’ve seen cases like that before, and God didn’t do anything for them,” you may say. Wait a minute. God doesn’t do anything for anybody unless that person finds favor with Him. Did that person find favor with Him? I know of cases where God didn’t do anything either. They’re crying and begging and crying and begging God to do something, but they’re full of unbelief, and God hardly does anything for them. Stop your unbelieving crying and begging. We’ve all been taught the same way, every last one of us. A member of the family dies, and the family begins to faint and fall on the floor and cry. The only One Who doesn’t do that is Jesus. We did nothing like that! When you don’t do it the Bible way, you don’t get Bible results. When you do it the natural way, you get natural results. That is all you’ll ever get. It’s that simple. It’s just that simple. Why does God want me to teach you this? Because the next time that the devil comes and tries to knock you for a loop or one of your children gets into a car wreck and the doctors tell you that they don’t know if they will live or not or some goofy thing happens to you, He wants you to know what to do. to come upon their body. Wherever they are right now, in Jesus’ name, let your mighty power come upon their body so they will live and not die.” Then walk the floor and pray in the Spirit. Pray victory. Pray in the Spirit. I had to do that a while back one night for about an hour in my house. When I got the long distance call from Texas nobody was at the house but a pastor friend of mine and me. An Assembly of God pastor from Dallas, Texas, had just had a heart attack. After about an hour, the glory of God came into that room. My pastor friend fell over on the couch under the power of God and began to prophesy. God told us that we had prayed correctly. There was no hope for him. He had just had a massive heart attack. But after an hour of praying in Jesus’ name and claiming his health in Jesus’ name, God healed his heart. God will heal your heart, too. He can pump a new heart into your chest just that quick. The Lord can give you your eyesight just that quick. Jesus can give you a new kidney so quick it will make your head swim. There is only one Jesus, friend. You may have been misinformed up until this point, but now you know the truth, and the truth will set you free. The truth will make you well. First of all you establish a lifestyle of praising His name and worshipping Him. Then you go to Him in prayer. Do you understand that? There is a way to get your prayers answered, every one of them. It isn’t hard to get your prayers answered. If you’re dying with a disease, you can get your prayer answered, and the healing power of God will come into you and drive out affliction, just totally drive it out. But you’re going to have to pay the price. You are going to have to make your own covenant with God and make a commitment to worship Him daily. You’re going to have to make it a way of living. If you’ll establish a covenant with Him, if you’ll praise Him and worship Him, He will become your God all the time in every situation. Sometimes in life you have these great big situations, these great big mountains to fly up over. You don’t know how to handle it. That’s okay because He does. Don’t worry about it. Just get on your knees and praise Him and worship Him for a while then bind up the devil and pray in tongues for about thirty minutes or an hour, and bless God, I guarantee you that victory will hit you like a bolt of lightning. You can’t do it, not if you want to live by faith. You’ve got to flip that mess over on God. I don’t care what it is. Throw it over on the Lord. Make a covenant with Him and begin to praise and worship Him, and I’ll guarantee you that God is big enough to get the miracle for you that you need. Do you understand what I’m saying to you? Get a glimpse of what I’m telling you. If you can just get a little glimpse of it and throw that great need you have over onto God, instead of trying to drive yourself nuts, God will do a miracle for you. It’s all right to go to Florida and walk the beaches for a while and listen to the waves. That’s all right. But there isn’t any reason for you to be beat down when you go. Throw your need over on God and worship Him then go.